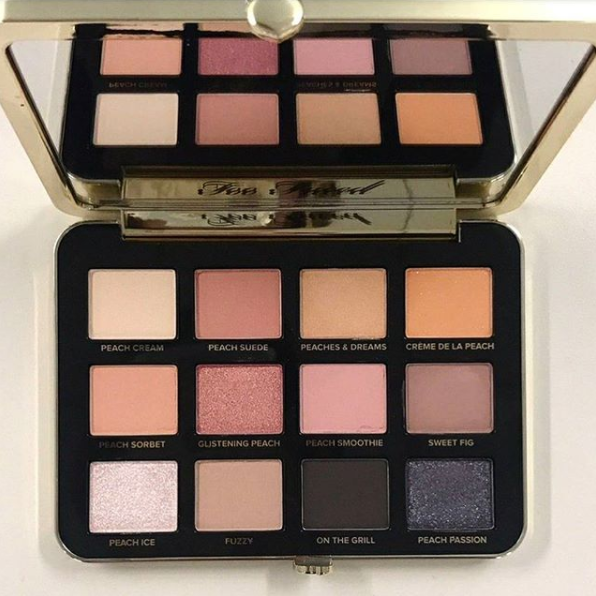 Too Faced is not wasting any time this year – they’re already throwing ANOTHER eyeshadow palette at us! TP is launching their adorable White Peach Palette on Tuesday, 1.16! We have to admit, Too Faced has been going hard with these adorable new releases (like their Chocolate Gold Bar Palette). The newest family member includes 12 shades: Peach Cream, Peach Suede, Peaches & Dreams, Creme De La Peach, Peach Sorbet, Glistening Peach, Peach Smoothie, Sweet Fig, Peach Ice, Fuzzy, On The Grill, & Peach Passion. The palette will be available first on Too Faced‘s website for $45 and then exclusively on Sephora starting the 16th. Too Faced has been running with their peach theme for quite a while and they aren’t quittin’ yet! 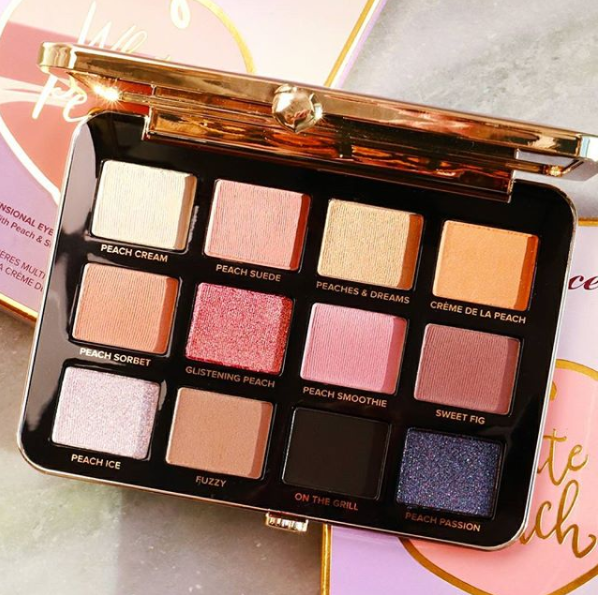 There were mixed reviews on the Sweet Peach palette that launched last year in the same format and packaging due to complaints about pigmentation, shade selection and quality. I will say, that one didn’t blow my skirt up, either. But this one has got me taking a second look! There is a huge selection here of super light-toned, soft shades (obv, it’s called the White Peach palette) but we do at least have 2 deeper tones included to give us a few options. 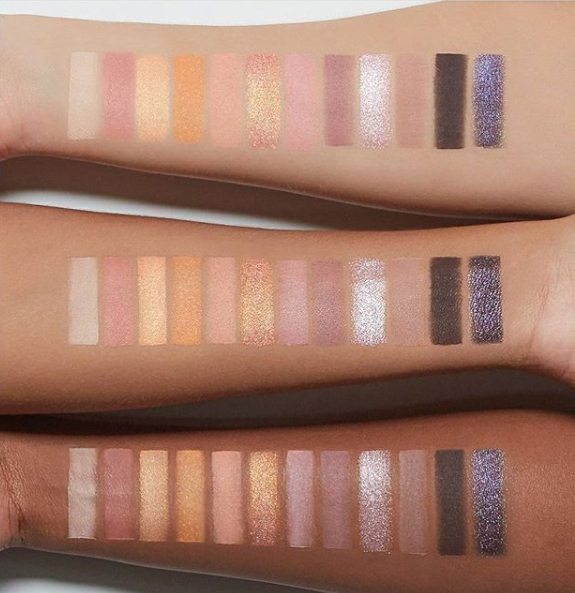 Looking at each shade individually, for example, in the swatches above makes me absolutely fall in LOVE! But as a whole, I’m thinking this palette may be a bit difficult to use. Because so many of the shades are similar in intensity & tone, I’m worried it would be tough to combine many of them into a look in which they all hold their own. So many similar light shades blended together may lead to a muddled look in which everything ends up blending together with no dimension to speak of. The shimmer shades look AMAZING, on the one hand. I can see everyone falling head over heals for Glistening Peach and Peach Ice – those might be the show stoppers here! However, Peach Passion seems a bit out of place in such a soft, peachy pink world. But maybe blended on the lower lash line, it could add lots of sultry-sexiness?? I’m just not sure about this one, folks! I suppose if you’re a plain Jane and prefer very subtle eye looks and natural definition without anything too noticeable, the may be right up your ally! Or maybe to combine with other darker, more smokey palettes? I just can’t figure out where this palette fits into my collection so I’m thinking maybe it just doesn’t?? Help me decide! What do you think of this one? ?